Dairy Creek, which is located on Highway 1 across the street from Cuesta College, relies on recycled water from the nearby California Men’s Colony. As a result of prison realignment, the inmate population at the Men’s Colony has decreased from 7,000 to 4,000. With fewer inmates housed at the prison, Dairy Creek is currently operating with 45 percent of the water needed to provide desirable conditions for golfers. The course has an annual shortfall of 142 acre-feet of water, and golfers are complaining about the grass turning brown. The Dairy Creek budget currently contains a deficit of more than $500,000. Golf rounds have decreased by 29 percent and revenue has fallen by 39 percent. On Tuesday, the board of supervisors directed county parks staff to explore ways to continue operating the course. 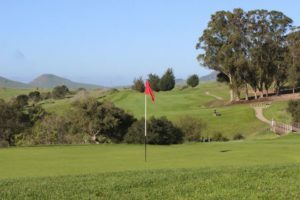 The supervisors said they are willing to invest as much as $485,000 from the county general fund to keep the course open. Supervisor Bruce Gibson said golf teaches a set of values and offers an athletic opportunity. County officials are considering installing a water storage pond, which would would cost about $1.2 million. The course already has three ponds which are used to store rainwater. Officials are also considering purchasing as much as 100 acre-feet of water from Whale Rock Reservoir . The county owns a total of three golf courses. The other two are Morro Bay Golf Course and Chalk Mountain Golf Course in Atascadero. The three courses have a combined annual operating cost of $2.7 million. As I recall, when this course was built, the final price tag came close to $20 million with bonds and construction management fees to Vanir Construction, the same firm that ripped off the San Luis Coastal USD in the 1990s. That is an outrageous amount of money to invest in a public golf course. I was at a tournament there last year or the year before. The copier machine didn’t work, the pro had quit two weeks before, and his replacement had never run a tournament before. Everyone said they would never go back again. It was hailed as a “green” course and you can see what a mess it is now. There are many other uses for it so instead of pouring more money into it, perhaps it is time to do something else with that land or turn it over to a private company as suggested elsewhere here. Let free markets do what they do. Turn that golf course in to a campground or throw some trailers on it for qualified homeless people trying to turn their lives around. Oh yeah and that $1.2M storage pond? Bull manure! Have a senior (or a group of seniors) in Civil or Ag Engineering at Cal Poly design the damned thing. Then go get the Army Corps of Engineers who train across the street and need “bulldozer time” to move the required earth. Add maybe $10-50K in some piping and a pump and you’re home! Mostly our government elected are for personal gain not truly solving problems with their brains with creative solutions. If we used our brains what a wonderful world we would live in. We no long solve we instead put the boot of the government on our throats by sitting down. Time to stand up but first you must elect people with honor, brains and courage and SOLVE problems not be one. That would be for all of us to help no matter where you live get these 3 people elected in June. All these people do is spend money! I can just imagine the SLO County minion thumbing through “Golf Course Superintendent’s Monthly.” They read a story about an expensive pond (written by the company who builds such ponds) and end-up calling for a quote. No problem, the taxpayers will pay for it! Once the quote is received they hire a local consulting engineer to give an opinion that it’s what the county should do and wham, it becomes a budget item. The county is not the low-cost solution to operating a golf course. I really do think it should look elsewhere for management to run these courses. Something is failing (Golf rounds have decreased by 29 percent and revenue has fallen by 39 percent) so throw another $500k to $2M at it. It’s absolutely maddening. Golf courses were overbuilt in this county during the brief golfing boom prior to the ’08 recession and during the height of Tiger Woods’ popularity. Much nicer courses than dairy creek are cutting their rates to entice golfers to play at their courses. Two things come to mind. First, I suspect if this property was being run privately (without the bloat of the county) that it would turn a buck — even if it had to purchase some water. So maybe the county should contract with a private firm/individual to operate it? Even at break-even to taxpayers, it would be better than the deficit they now face. Second with three county-owned golf courses in such a prime tourist location it’s amazing the county hasn’t sought out promotional $$$ from BIG GOLF (read BIG MONEY!) Let Titleist, Ping, Callaway, etc. stick their names on the courses. Let them advertise! Then again the county would likely have to engage a consulting firm and hire 12 more FTEs to make this work nullifying any gains.